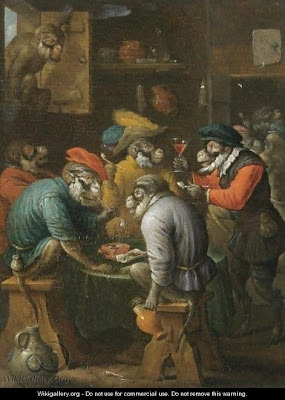 I think I've shown great restraint in not indulging my deep and bewildering love of monkey art in this space recently. And I'll continue to show restraint. 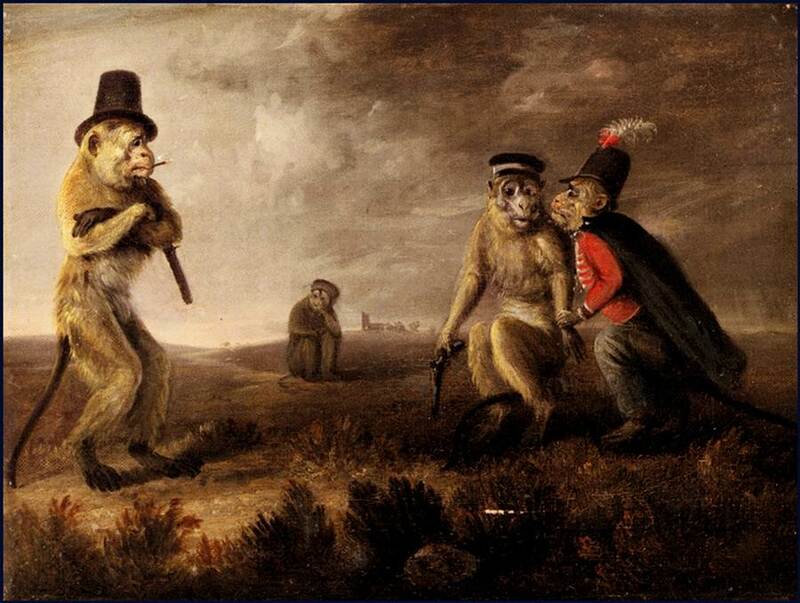 Today I'm only going to put up a few images of monkeys wearing adorable people clothes and doing people things. 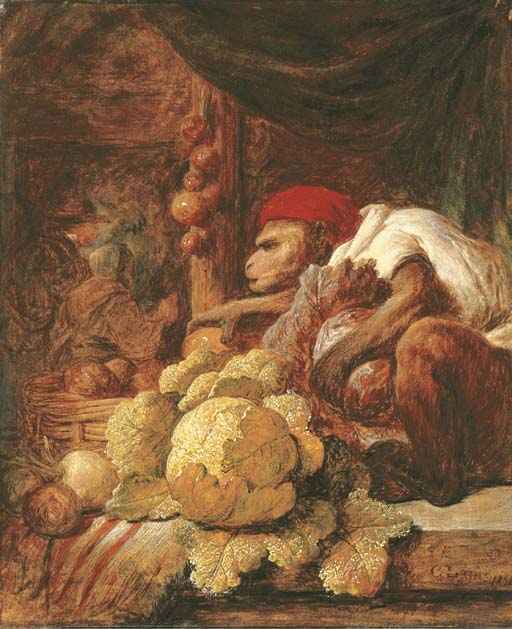 I might actually buy cabbage if this simian gentleman were the proprietor. I feel it is totally necessary at this time to post a picture of a monkey barbershop in which all the customers are cats. This seems unlikely, but there are actually a lot of paintings on this very theme. But not all singerie depict monkeys engaged in human activity. 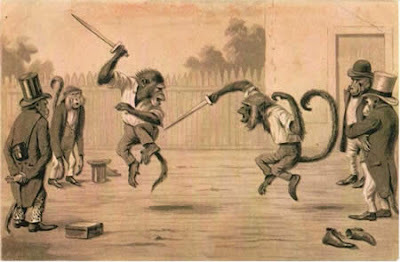 Here's one that shows a monkey doing a very monkeyish thing. While dressed in people clothes. Yeah, yeah, wait your turn. I can only pick so many nits. Why, you ask? Why am I so fond of this rich and beautiful artistic genre? More cats. 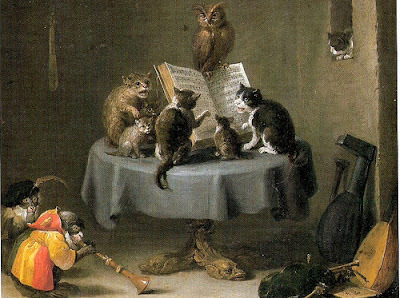 Singing cats. With jazzbo monkeys. You have to ask? Monkey freaking Knife freaking Fight. Sadly, I have not yet achieved my dream of acquiring a framed print of Edmund Bristow's "Before the Monkey Duel" for my formal living/dining room. But sometimes dreams are sweeter for going unfulfilled. And sometimes they're all Holy crap I want this now! You know, it just depends. This is who I am, people. Love me, love my monkey art. And make sure I stay on my meds. Because sometimes the monkeys talk to me late at night. Um, you can ignore that part. 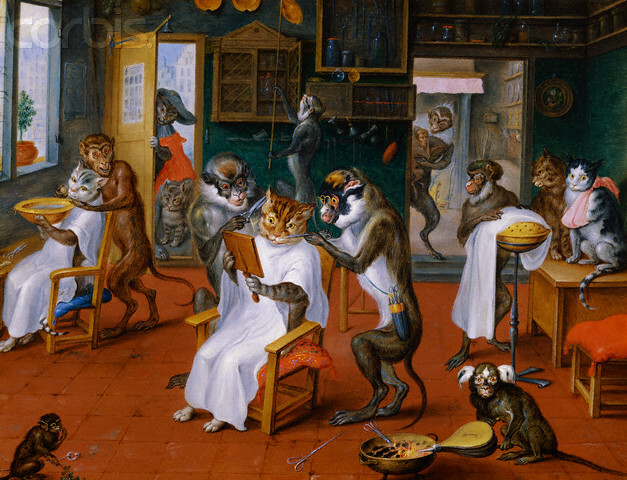 The monkeys are telling me to stop writing now. 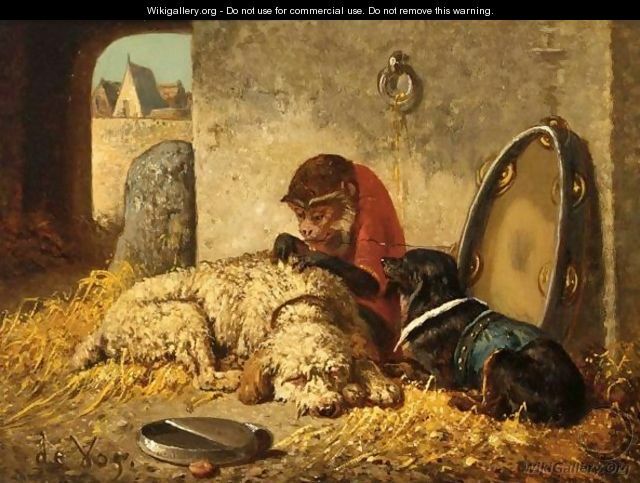 Beautiful all this funny monkeys.I see you have already find Vincent de Vos,but have you try Charles Verlat - Artistic greatings from Menen (Belgium). Thanks for the follow, and I will look up Charles Verlat!